Shortly after her return to Connecticut in 2015, Bruna met her husband, Christian, a former Marine now enrolled in the Connecticut Police Academy. After much sadness over a failed first pregnancy, the couple are happily expecting their first child, a son, in early December. Today Bruna is one of about 300 women receiving their obstetric care at Southwest Community Health Center in Bridgeport. The center is partnered with Read to Grow’s Prenatal Project, which means pregnant women receive information about early childhood literacy and new, free baby books. The OB patients learn about the importance of developing the language skills of babies and how parents are their children’s first teachers. With the new board books, they can create home libraries before their children are born. Southwest is one of nine partnerships in our Prenatal Project. The others are with: Connecticut Children’s Medical Center in Hartford; Fair Haven Community Health Center and Cornell Scott Hill Health Corporation, both in New Haven; Women’s Center at Yale Primary Care Clinic in New Haven; First Choice Community Health Center in East Hartford; UCONN Health Nurturing Families Program in Farmington; Optimus Health Care in Bridgeport; and Norwalk Community Health Center in Norwalk. Read to Grow staff continue to expand this work at other community health center. Over the months, Bruna has jumped at the chance to learn about the best ways to prepare her baby for success. 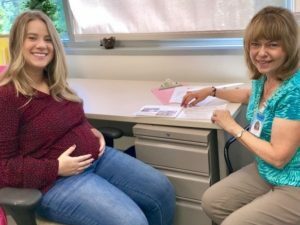 Even though she grew up with books and could read before kindergarten, she became aware through the Prenatal Project of just how early that learning begins. The Fortunatos hope their son will eventually have command of not only English but also Bruna’s native Portuguese and Spanish, which Christian speaks.